the XJ group and the China State Grid signed a "Cooperation Structure agreement" through China Electric Power Research Institute. Based on the agreement, the China State Grid will acquire 100% share of the XJ group and will become the sole owner of the XJ group. 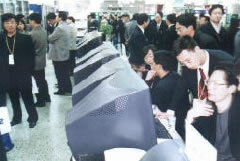 The XJ4th user group meeting and exhibition held in Xu Chang city , China on April 18,2002 for 3 days. About 1000 users from China, South-Asian countries attended. In 25000 square feet exhibition hall, Siemens¡¯s communication, Toshiba¡¯s GIS and NCT, Hitashi¡¯s GIS, LG switches shared the hall with XJ products. Doubletree Systems' full set of Substation Automation & Equipment Condition Monitoring solution ¨C POLARIS was on the exhibition. 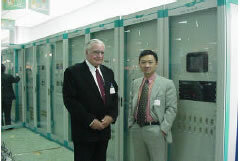 And Jim Y Cai, president of Doubletree Systems gave a technical presentation on trend of substation automation/IT. The users showed great interests in POLARIS solution¨C integrated substation automation & equipment condition monitoring. The solution is based on Linux & Window platform. XJ Group is the biggest power equipment manufacturer in China and owns two public companies. Please refer to www.xjgc.com for details. Doubletree Systems, Inc., located in California, US. Please refer to www.dsius.com for details.